Our Pipes Alive! 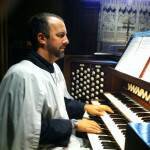 series of short organ concerts continues on Sunday, April 7 at 12:30 p.m., featuring our own Scott Lamlein, director of music at St. John’s and artistic director for the Music at the Red Door concert series. The concert is free, with donations accepted.